Photo: Looking northeast from Douglas Island. Photo by Jet Lowe, 1991. Historic American Buildings Survey [HABS AK-116], memory.loc.gov, accessed September, 2012. The City of Douglas was incorporated in 1902. It is an island in the Gastineau Channel across from Juneau. Two settlements had grown on Douglas Island following the 1880 gold discovery at Juneau — Douglas and Treadwell. A Treadwell mine cave in of 1917 marked the beginning of decline of the town. By the late 1920s Treadwell had pretty much disappeared as town and Douglas became the sole town on the Island. 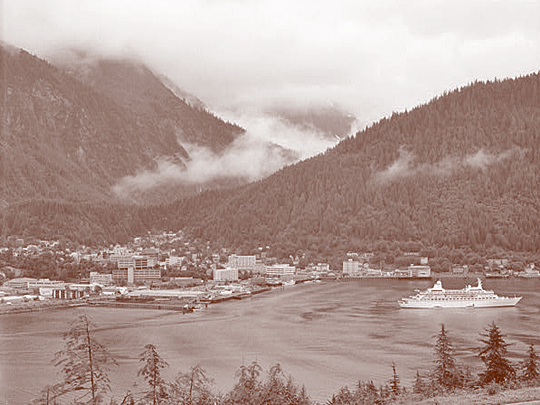 In 1970 Douglas merged with Juneau becoming the consolidated City and Borough of Juneau.